Logitech has unveiled its new multi-device Bluetooth keyboard with built-in universal Windows, Android, Mac and iOS keyboard support and compatibility. The K480 is a multi-tasker's dream come true. Inspired by Logitech's popular portable Ultrathin tablet keyboard covers, the K480 is designed to be used as a wireless desktop keyboard with up to three different devices simultaneously across all popular handheld and desktop platforms. The Logitech Bluetooth Multi-Device Keyboard K480 makes it simple for people to work, create or communicate quickly and comfortably, no matter what computing device or platform they are using. You can type in comfort on a full-size desk keyboard with a familiar layout and all the shortcut keys you use the most. Like Logitech's Easy-Switch Bluetooth keyboards, the K480 features a a switch dial enabling you to easily switch between three different paired devices allowing users to seamlessly switch from typing on a desktop computer to answering a text message on an Android or iOS device using the same keyboard. In addition to its 11-inch wide full-sized keyboard layout, the K480 features an integrated stand made to securely hold your tablet and smartphone while providing a comfortable viewing angle and a typing experience. The stand supposedly has enough room to accommodate both a large 5-inch smartphone and a 10-inch tablet in portrait orientation at the same time as shown in the video below. While it does not have a built-in rechargeable battery, the K480 uses two triple A batteries (included) said to last for two years under normal daily use. 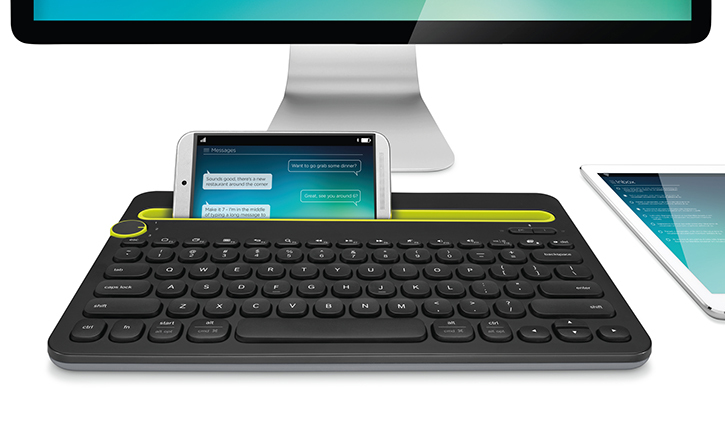 Logitech's multi-platform Bluetooth keyboard is available now in white and in black for $50.